Monterey Colonial "During"!! again before the "present" to be posted in the next few days!!! Exterior! last post”during” a day or two before the “present” so no one has to search for it!! Here was the post last May! The above is “present” exterior! Hi there all my friends! I am so sorry this has taken so long! I am so enthusiastic and excited about it! My assistant (who helped me endlessly with my blog) left to travel; and I thought I knew more than I did how to do it! This is such an exciting thing for me; and I want to share all the things I have learned! Here goes the first one! 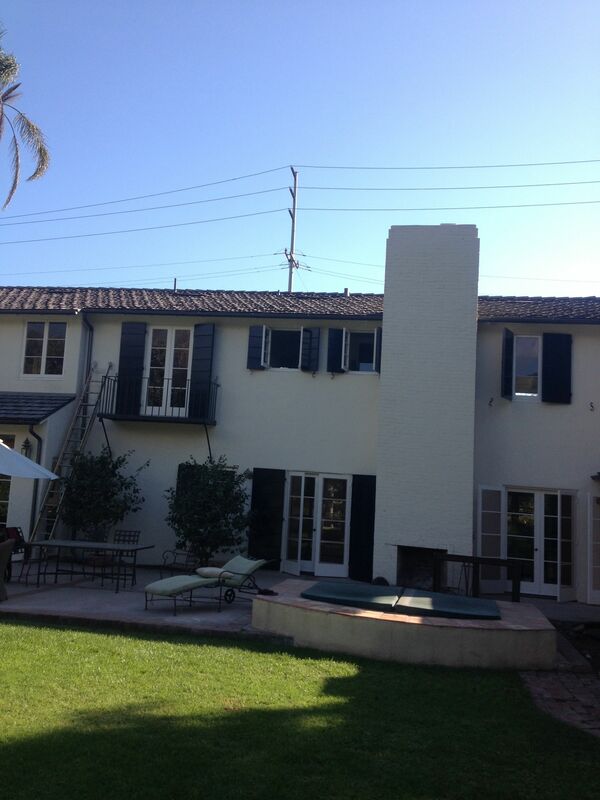 The “exterior” during! And that doesn’t even include the garden! This is a Joseph Plunkett designed house built in 1935 in Montecito, California. and many other buildings and houses is Montecito, Santa Barbara, Ojai and Santa Ynez! He died at 46; which is even more astonishing that he designed so many buildings that are so well known for their artistry! I thought I would do one post on the “during”! There will have to be more than one! I am starting on the “exterior”! And this is the first of the “during”! The post on the “before” was my last post! 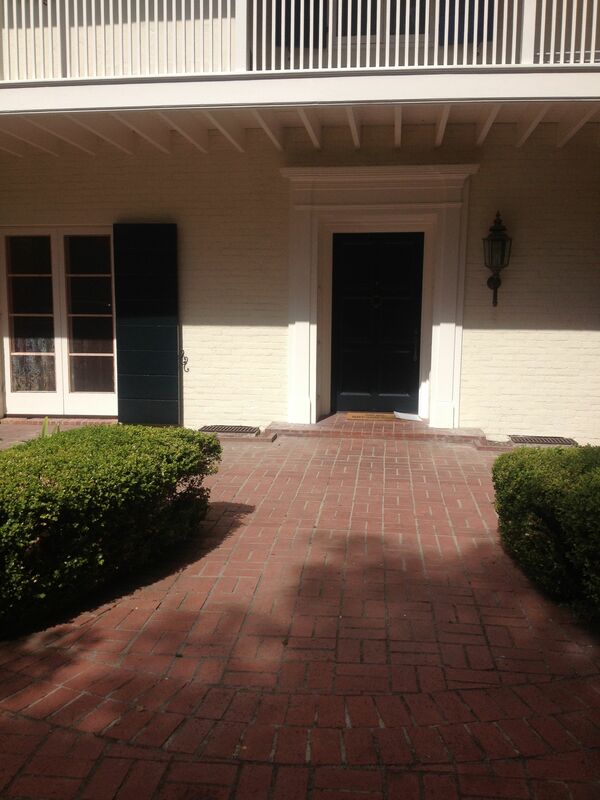 Here is the “Monterey Colonial” house I found for our daughter’s family here in Montecito! Their goal was to “move back!”I started looking two years ago! I knew when I walked in the door………this house took my breath away! I knew it would take a lot of work to restore it; but I didn’t really know HOW much! Sad to say; this house had been neglected in ways many older houses are! It is called “deferred maintenance”! It is extremely common in old houses! designed a few wonderful houses; and unfortunately died very young at 46. His name was Joseph Plunkett. This house is a complete treasure! I hope I will show you why!! I am going to start with the exterior! in dealing with an old house (it is always more expensive than just slapping on some paint)! decorators on this earth (in my opinion); and her explanation of the importance of “specialists” cannot be better explained! My darling friends Brooke and Steve Giannetti I asked to come see the house! They did and they loved it! Steve solved the “roof problem”! No where in Santa Barbara County can you on a put a new wood roof! There is simply not one single “composition roof” that looks like real “shake”! Except this one! The roof was on its last legs. You could see sky when you stood in the attic. And the roof is huge! It goes across the entire house; over the “porte-cochere” and the two and a half car garage! how to treat the side views so they didn’t look like ‘fake slate’! Here are the “planters” inset in the brick front terrace! This was where the “leggy hags” lived! My total favorite Tara Dillard expression! 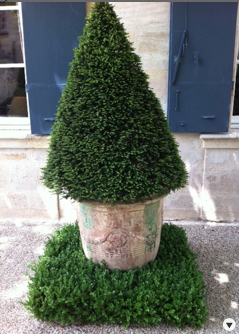 This is planter bed our daughter found at a chateau in France! The exterior of the house had not been painted in over 35 years; and it was pink, with turquoise shutters! The amount of preparation to sand and prepare the exterior woodwork and brick and stucco was mind-boggling! the restoration of a fine old house than fine painters. I often say to clients: “nothing is more expensive than ‘cheap painters’! Without the proper preparation; harm will be done that is almost unfixable. Hire “cheap painters” at your own risk! It was completely worth it; because it will now hold up for many years to come. We spent a long time on the phone! The roof off; and the shutters off preparing to paint! This looks like it is yellow; but it was pink! Honestly, pink! and the shutters and front door are “Black Blue ” in “full gloss” Also Farrow and Ball! Now we start the new colors outside! Here is the “before ” front door! Please excuse the photographer (me) the new front door! Well; it was a neglected “beautiful woman”; in m opinion! It had simply not been “kept up”! And houses (and people) do deteriorate when they are not “kept up”! I saw this house as a magnificent beauty in dire need of restoration and “heavy cosmetics”! The bones..as so many of you commented were perfect! This is the exterior! For my next post…….I will do the “during” of the interior! Yikes! It is such an exciting thing to bring a beauty back with restoration! This house reminds me of the model “Carmen”! She is gorgeous at 81! This house is 78! It needed help……but the “bones” were perfect; and no “remuddeling” had taken place! Who thought of an outside fireplace in 1935? One chimney serves 3 fireplaces in this house! Living room, this outside, and upstairs in the master bedroom. All use one chimney! Now we see the new color scheme! I think it makes a “magical” difference! The chimney looks so pretty as “a part of the house”! We do love the new , more classic, colors! That chimney was a bit of an eyesore! (I am having a bit of a crisis! Newell Turner, my friend; editor of House Beautiful; recently promoted to “editor of all Hearst Design Publications”!! Look how the shutters really “work! They have no curtains or anything yet! This is what shutters were invented for! This shows the new roof! This has been a six and a half month labor of love! It won’t be as long before I post the “during” on the inside! Some spectacular before and afters! They have moved in; and there is still more to do; they are all ecstatic! On our chickens; one hen just hatched seven chicks! A lovely post by a fellow designer! Yesterday, I was stunned when I received a post by my new friend, Julie of TG Interiors! thinking about a design career! She lives nearby, and I invited her to lunch and we spent a nice afternoon chatting about our business! I was so touched, I cannot tell you by this beautiful and generous post! I was touched, and thrilled and surprised! You will see why! Thank you , Julie, from the bottom of my heart!